Star Crystal, cont'd: Because the leaves for applique for Star Crystal are nearly 6 inches across, there is a lot of fabric without a lot going on. I decided vanes in the leaves would break up all that space and really make them look more like leaves. 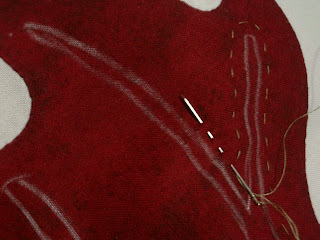 My original design included the vanes, but since they are quite skinny and delicate, it will be easier to use a reverse applique process. 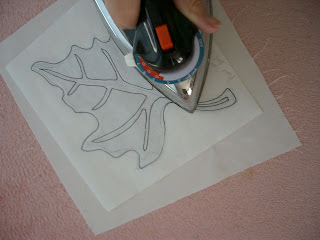 I used my Freezer Paper design and a marking guide for the vanes. 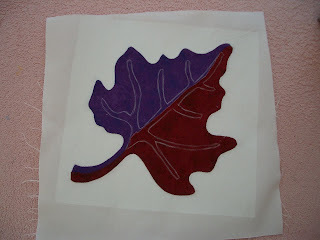 First, I adhered it to the wrong side of the finished leaf block, aligning the markings with the outer edges of the leaf. 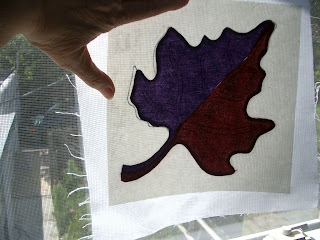 I have lots and lots of large windows in my sewing room, and they make great impromptu light boxes for quickly marking small pieces. 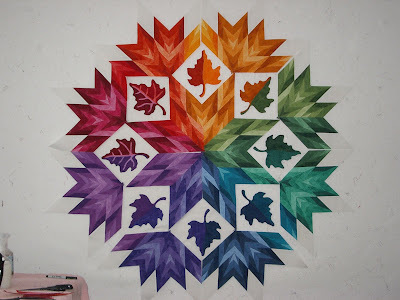 Since I used the darkest shades for the leaves, the vanes will be from the lightest shade of each rainbow color that I used for the Star Points. 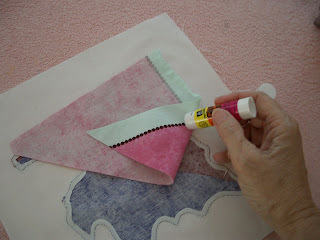 I cut a triangle of the light fabric, and glue-basted it in place on the wrong side of the leaf block, making sure that all the reverse applique places are covered with a little extra fabric on all outer edges. Turn the piece over. Stitch a row of basting through both fabric layers about 1/8 inch outside the marked lines, as shown below. 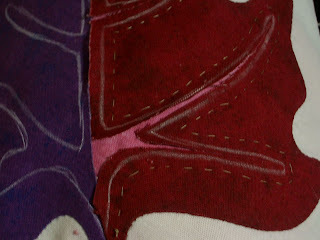 After basting around the markings, carefully cut only the top layer about 1/8" inside the marked lines. Cut exactly through the center of narrow channels to the rounded end. 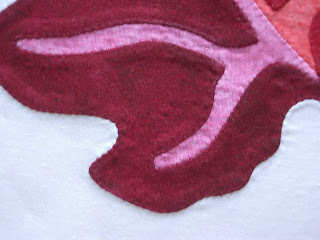 Needle turn the edges under to the marked lines, and applique the edges in place. 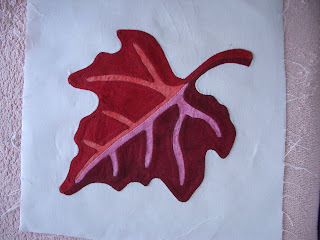 Finished leaf block and detail: Marking Tools: There are lots and lots of different marking tools available. A frequent question I get when teaching is what marking tool(s) I like to use. I have 3 important criteria for marking tools. These criteria are: 1) I can see the line. It is visible, and thin. 2) That mark stays on until I choose to take it off. This criteria eliminates most air-erasable pens, chalks, soap chips, and other marks that quickly disappear. 3) The mark comes out completely and easily when I choose to remove it. 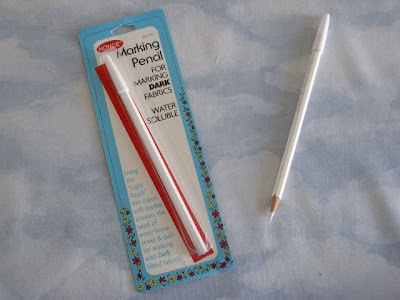 NONCE marking pencil for dark fabrics— My favorite marking tool for marking dark fabrics is the Nonce water soluble marking white pencil. 1) The line is fine and visible. The Nonce pencil lead is soft, so it doesn't pull on the fabric while marking, but it dulls quickly. I keep a cordless pencil sharpener close, and when marking a large quilt, I sharpen 6 or more pencils before I start, and change pencils when one gets dull. I will stop when all 6 have gone dull, and take the time to sharpen them all at once. 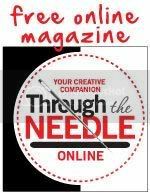 2) I've had Nonce pencil lines stay visible when I'm quilting black quilts for as long as 2 years. 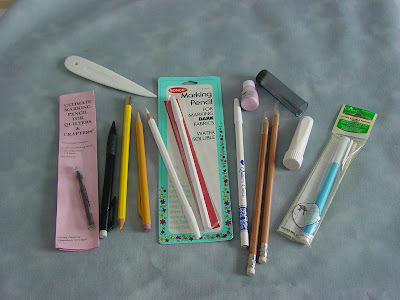 3) The Nonce pencil marks simply wipe off with a damp wash cloth. No need to immerse the piece in water, or to scrub to get the marks out. Do you have questions about marking tools? Or about marking in general? If I can answer them, I will. Progress on Star Crystal is ongoing. I plan to post photos along the way. There are so many more design decisions to be made, and piecing problems, too. And then there are borders to think about, and quilting designs. All parts of the quilt must relate to the center features, and I've got a lot of work to do. I hope you are enjoying watching the posts about this process. Please post a comment to let me know you are out there. I'm used to dialog and it is hard for me to write a bunch of stuff here without knowing you are out there. Tell me if there are things that are not clear, or if you have another favorite marking tool, or way of doing things, feel free to share it here. Thanks for following along. It's gorgeous Elsie! 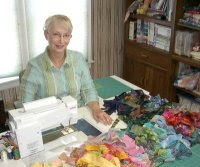 I love applique, but I have never tried the "reverse method." It's on my hope to someday list. I love what you are doing here and can't wait to see the final version. Absolutely stunning. Can't wait to see it finished. the reverse applique really sets it apart. Just found this post while I was searching for help on removing the Nonce marking lines. I use this same pencil, but as I dabbed the area I wanted removed with water, it left a white ring where the water dried! Help! Has this ever happened to you and what did you do? Quality of the water might be the difference. I'd try again. This time, rub a little and see if that will help. Maybe use distilled water, if it is available. I've never had this happen.